In instances where the resulting object would otherwise be infinitely large, it could be trimmed down to, say a 16th wider and taller than the area of the original objects (this would be a great feature of the Fill tool as well). I swear this ability would be extremely helpful, especially when working with images (though I'm not going to strain to recall an example). Could you elaborate why it could be so helpful with images? In the work I do most of the time what I need is to clip (or mask, but usually clip) the image like it does already. Clipping paths are used to enclose a particular region of the image. I'm sorry- by "when working with images", I meant: " when using mask with raster images". In one project this would have prevented me from having to copy and then invert an image in another program to get mask to do what I want. And then there are cases when I want to easily compare the results to decide what I prefer. I also find this an extremely important feature. I just found this page after looking for a way to make an inverse clipping. What I'm currently trying to do is to make an object "cut" the objects below, and as far as I know this isn't possible yet. Hope we get this feature soon, I'm planning to use Inkscape on some professional work. By the way, about my last comment - It would be like using the "Difference" function (Ctrl + -), but working as clipping. Yes. This would be extremely useful for me. The image I'm working on right now has one big shadow on it, which has much heavier blur in one place than others. That means it has to be two objects. Trying to line up the edges of two blurred translucent objects so they look like one is nigh impossible. It'd be much easier to just use a duplicate of one as an inverse clipping mask for the other. I find myself wanting to do this quite often; the usual solution is to create a big blob around the two and cut out of it. But inverting a clip mask would be much cleaner and easier. 4) Select the rectangle and the hole, then Path > Difference to create the clipping path. 5) Select the base path and the group, then Right Click > Set Clip. So applying an inverted mask would require inkscape to automatically do step 2 & 4. I totally agree, this would definitely be very useful and much easier by just masking the desired part of an object instead of having to try to encompass the entire object. This would definitely be a very useful feature, especially when used in combination with path cloning to create shading. 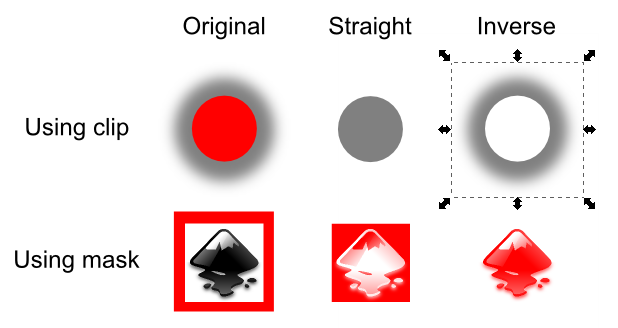 I don't know if it would make it into Inkscape since there's not really an exact SVG 1.1 equivalent (or an SVG 2.0 equivalent currently, although different compositing modes could be used to achieve the same result and the spec is still a draft). That being said, I've created a patch using r11949 which adds a "Set Inverse Clip" option to the context (right-click) menu of an object. When clicked, the top-most path is turned into a clip path as normal, but a new "inkscape:inverse" attribute on the "clipPath" element is set to "true", and essentially anything contained within the clip path is composited out when rendered. Again, I'm not sure if this could, or even should, end up in Inkscape, but this patch may be helpful to anyone who is looking to use an inverse clip mechanism. Are there actually any objections to this patch making it into trunk? Would it also require any file using this option to be marked as requiring a minimum version of inkscape? No other program will be able to render inverse-clipped items correctly. And the svg would still be perfectly legit. @vince - please read Ted's initial comment  - he explained in plain language what the patch does, and that is not conforming to the current SVG 1.1 specification nor to draft versions of the SVG 2.0 specification. Objecting to commit the patch (as is) to trunk, too. What about a similar approach to what inkscape is already doing with text -> path, where it keeps a copy of the text object so the path can then be converted back to a text object, edited, and back to a path? For inverse clipping, all you would do is, not even needing the encompassing rectangle, but just some path form of the object (I tried with a linked offset -- clones don't work, since they are not paths) being internally created to perform the path->difference, and then using that new path as the clipping object, but it remains internally linked to the original object, such that the original object can be edited, and when this happens, the clipping path is automatically updated. So the functionality to the user would be identical to clipping, but now they can do an inverse clip, while still having an SVG spec compliant doc. Do we need a copy ? As invertedclip = rect + MoveTo + baseclip, getting the baseclip would just be a matter of dropping the start of the path. Comment #8 is very useful to me, as this is exactly what I needed for creating glow/shadow assets for SVG buttons without the buttons themselves. I'm somewhat surprised that Inkscape still doesn't support this functionality. Pretty surprised this isn't supported. I need to properly layer strokes, to create the illusion of occlusion without a fill. There is a Live Path Effect (LPE) PowerClip and PowerMask that allow it. Also in last commit r.24e870081a allow gaussian blur for inverse. For IMages you can grup it and apply the LPE to group.